Full spectrum of MDM offerings. Informatica’s Data Integration and Data Quality products combine with Siperian’s for a comprehensive master data platform. Siperian brings some of the best data acquisition, data cleansing, relationship and hierarchy management, event management, reference data management, data stewardship, and architecture to market. Usability and rich graphical interface are other strong points. In addition, the Identity Systems match engine and AddressDoctor postal validation already serve as best of breed solutions in many data quality initiatives. 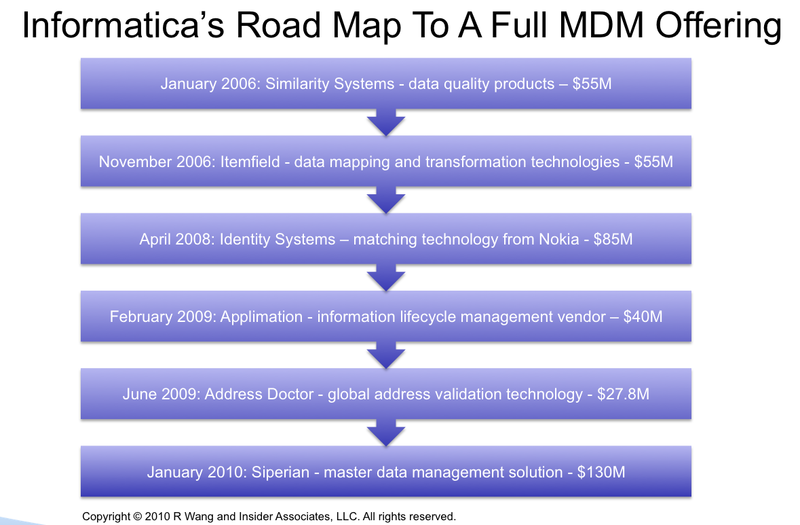 Point of View (POV): Informatica has been slowly tip-toeing in this market with 6 acquisition in 4 years for almost $400M that assemble the key components for a comprehensive MDM offering (see Figure 1). Informatica can now offer a wide range of entry points from smaller data quality projects to larger identity management projects enabled by a series of data integration flows. Siperian is the crown jewel that takes Informatica directly into the MDM market and puts competitors such as Oracle, IBM, Initiate Systems, and SAP on guard. Attractive, referenceable, customer base. Informatica gains over 60 forward thinking MDM customers. Key customers include big names in financial services and life sciences such as Bank of America, Pifzer, Shire, State Street Bank, Johnson & Johnson, and Lexis-Nexis. These early adopters have pioneered some of the latest MDM success stories. POV: While the press release focuses on the financial services and life science customers, Sipeiran has taken big deals away from SAP, Oracle, and IBM in high tech and retail players in North America. A very loyal Informatica base will most likely consider the Siperian offering in short lists, as it is now part of the family. Many of these customers also run Oracle and SAP in the back office. Improved data governance. Siperian’s Business Data Director was one of the first tools in the market to address the issue of data governance. Working with Lombardi’ s Teamworks BPM software, Siperian allowed customers to quickly manage assignment, workload distribution, state management, and event routing. POV: Data governance capabilities will provide a clear differentiator in the success of MDM implementations. Organizations often struggle with managing the Information Supply Chain (i.e. what data, to whom, for when, how often, and where). Given IBM’s acquisition of Lombardi, expect Informatica to consider other BPM tools in the future. Synergies with Cloud strategy and Social CRM. The Informatica Cloud and related data integration heritage provide the pipes critical to cloud strategies. Informatica delivers data partitioning support, data processing latency, and hybrid data integration. Siperian provides the mechanism to manage multiple sources of information, maintain the golden record, and accommodate multiple domains.